Relatively few U.S. generals lost their lives in World War II. General George S. Patton, Jr., once said, “An army is like a piece of cooked spaghetti. You can’t push it, you have to pull it after you.” He was referring to commanders being leaders as he had little use for commanders that were not out in front of their units. This attitude was the norm in the U.S. military in World War II, and the amazement is not that a few dozen general officers were lost, but that U.S. armed forces did not lose more! Leaders being out front or is not a unique military concept, nor exclusively that of the United States. Since the earliest days of recorded warfare, the good leaders have always been at the forefront of battle. Some nations have a unique concept of control over military leadership. This was especially evident in the Soviet Union in the years before the onset of World War II. During the war, Hitler not only directed military battles, but controlled the general officer corps to an incredible, and as it turned out, disastrous degree. A few years before World War II Soviet Dictator Josef Stalin purged the Soviet military of most of its high ranking and experienced officers. During his frenzied attack on the officer ranks through the end of 1938, Stalin had executed at least 65,000 officers, including 13 of 15 generals of the army, 93 percent of all officers ranked lieutenant general and above, and 58 percent of all officers ranked colonel through major general. Ironically, one of the few senior commanders to survive, Dimitri Pavlov, would be executed within days of Germany’s invasion of the Soviet Union because of incompetence. After the war started, Germany was equally hard on general officers. During the course of the war, Hitler executed 84 German generals, and another 135 generals were killed in action. The United States, of course, has never had a policy of executing officers, even for inexcusable failures. The U.S. does have a tradition, such as that displayed following the disaster at Pearl Harbor, of relieving and even demoting officers that fail to meet expectations. Two flag officers, Admiral Husband E. Kimmel and General Walter Short, were relieved of command and demoted after the Pearl Harbor attack as they were, rightly or wrongly, held responsible for failure to plan for this eventuality. The United States suffered about 407,000 military deaths during World War II. The vast majority of those killed were enlisted and lower ranking officers. However, there were some “fallen stars” as well. Nearly 1,100 U.S. Army generals served at some point during World War II, and of those about 40 died during or immediately following the war. Not all were in combat units, and some were not in enemy territory when they died. Of these generals, at least 11 were killed in action or died of wounds from hostile actions, two were executed by the Japanese while POWs, four were killed in plane crashes, one was killed by friendly fire, and five died of natural causes, including two of heart attacks. The remainder died of various causes in the first few months after the end of hostilities. Following are brief sketches of some of these American officers that were lost—some in battle, some by accident, some by natural causes—during the course of World War II. Some generals who died during the war are not mentioned here because it has been impossible to find anything more than a line noting their death. In one case, the record simply says “circumstances of death unknown.” This is, without doubt, because of the chaos of war. General Gustav J. Braun, Jr. was the assistant division commander of the 34th Division at the time of his death in 1945 in combat in Italy. The 34th Division was a National Guard unit from Iowa. Braun had served in various staff positions within the 34th, including chief of staff and commander of the 133rd Regiment, a subordinate unit. The 34th Division had fought some of the fiercest battles in all of the war, and at war’s end the division’s losses included 3,737 killed, 14,165 wounded, and 3,450 missing in action. The 34th Division had fought its way up the Italian peninsula and was in the shadows of Monte Bel Monte and its well-entrenched German defenders. Elements of the 34th Division attacked the defenders, with limited success. The arrival of deep winter led to both sides digging in to wait for spring thaws. It was during this stalemate when Braun was killed. He was flying in a light aircraft on reconnaissance when it was shot down by enemy gunfire. The nominal infantry division size during World War II was approximately 12,300 soldiers. Additional attached specialty units, such as engineers, intelligence, or medical often brought the total to about 15,000. The 34th Division was reconstituted several times to maintain its effective combat strength while sustaining such heavy losses. Lt. Gen. Simon Bolivar Buckner, Jr., was the commanding general of the 10th Army and was one of the highest ranking American officers killed in action during the war. Buckner’s 10th Army consisted of two corps, the III Amphibious Corps made up of the 1st, 6th, and 2nd Marine divisions, and the XXIV Corps with the 7th, 27th, 77th, and 96th Infantry divisions. The final battle for Okinawa, and what proved to be the final land campaign of World War II, was viciously fought from the north to the south. The campaign began on April 1, 1945, and lasted 82 days. During the final days of the battle, Buckner was killed by an artillery fragment. He was one of approximately 7,000 Americans killed in this battle that also saw the deaths of 110,000 Japanese soldiers by the time the battle ended on June 22, 1945. Buckner’s father, Confederate General Simon Bolivar Buckner, Sr., had surrendered to Brig. Gen. Ulysses S. Grant at Fort Donelson during the Civil War. Some have argued, perhaps wanting to prove that the apple does not fall far from the tree, that Buckner, Jr., was a racist and prejudiced against most minorities. Prior to his Pacific adventures, Buckner had commanded troops in Alaska and was derisive in his comments about African-American soldiers as well as native Alaskans. Brig. Gen. James Leo Dalton II was the assistant commanding general of the 25th Division in the Philippines. The 25th Division was involved in fighting across the South Pacific but met its strongest resistance in one of its last battles, capturing the Balite Pass at the head of Cagayan Valley at Luzon in 1945. The 25th was in combat for a record 165 days and lost more men to combat than any other U.S. division at Luzon. Colonel William Orlando Darby was the assistant commanding general of the 10th Mountain Division when it was conducting combat actions in Italy. Darby had been designated for deployment to Hawaii, but after the Japanese attack he was sent to the 34th Infantry Division instead. From there, he was able to get an assignment to the newly formed 10th Mountain Division and took to the stringent regime like a fish to water. 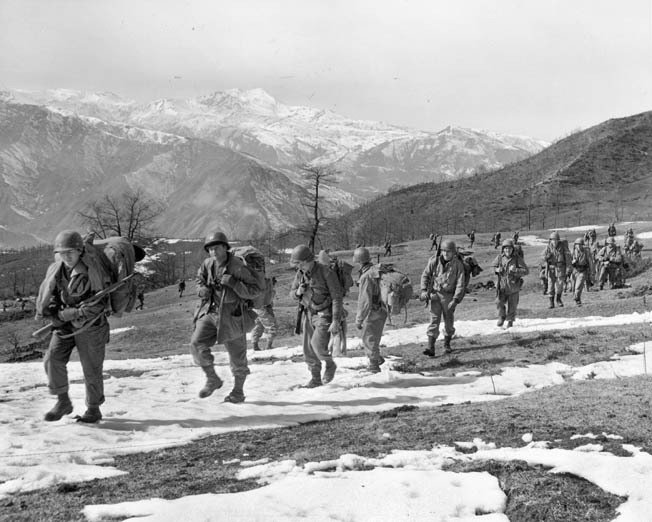 A line of 10th Mountain Division soldiers climbs Mount Belvedere, north of Florence, Italy, February 20, 1945. The hotly contested Riva Ridge is visible in the background. Darby, who had led a contingent of U.S. Army Rangers during combat operations in Sicily and Italy, was killed by artillery fire on April 30, 1945, just a few days before V-E day. His name had already been submitted to President Harry S. Truman for promotion to brigadier general, and he received the promotion posthumously, three months after his 34th birthday. Darby was the only Army officer promoted posthumously to flag officer rank during the war. Brig. Gen. Claudius Miller Easley was the assistant commanding general of the 96th Infantry Division when it was activated in 1942. The 96th Infantry was one of the few U.S. divisions to have the same commander throughout its World War II actions. The division was shipped to the Pacific theater and made an assault landing on Okinawa on April 1, 1945. Two months later, after being slowed by heavy rain, the division resumed the offensive against weakening enemy resistance. Easley was wounded by a sniper during the Leyte campaign and was killed on June 19, 1945, just days before the end of the last ground battle and only a few months before the end of the war. Brig. Gen. Charles L. Keerans, Jr. was the assistant commander of the 82nd Airborne Division. His death was one of the oddest to occur during the war. In 1943 the 82nd had prepared to make a night combat jump into the area around the Gulf of Gela, on the western coast of Italy. The effort was plagued with problems, including several American transport planes being shot down by friendly fire. Keerans’ plane was one of those hit by friendly fire, but the pilot was able to crash land the plane in the water, 400 yards off shore. Keerans survived the crash and the next morning chatted with a sergeant from another unit and asked the sergeant to accompany him inland. The sergeant said that he wanted to return to his outfit and left. Keerans went inland by himself and was never seen again. For several years the army assumed he had been killed during the ditching of the aircraft, but the sergeant’s story provided a different interpretation and the general was simply listed as killed in action, although his body was never found. Maj. Gen. Edwin Davies Patrick was the commanding general of the 6th Division, heavily engaged with the enemy on Okinawa, when he died of wounds he received in battle in 1944. Patrick was given command of the 6th Division in September 1944, and was in hostile action near Bayanbayannan, Luzon, at the time of his death. The battle for Luzon was incredibly bloody, with the sixth Army, which had entered the conflict with 200,000 soldiers, suffering over 38,000 casualties, the highest of any American army in the war. Rose was known as stern and ruthless in destruction of the enemy, but was deeply admired by his men. He was always at the front of the battle, directing activities from his jeep. Rose had enlisted in the Army in 1916, serving on the Mexican border. He attended officer’s training courses at Fort Riley, Kans., and was deployed to France, where he served with the 89th Division and was wounded in battle at St. Mihiel. On the night of his death, Rose and two other men rounded a bend and literally ran into a German tank. The German tank commander ordered the Americans to surrender, and when Rose made a motion to drop his weapon the German apparently panicked and shot him, but the other two escaped. Brig. Gen. James Edward Wharton replaced General Lloyd Brown as commander of the 28th Infantry Division in August 1944. A few hours later he was killed while visiting one of his regiments on the front line. The 28th Infantry Division was another of those World War II divisions that had to be reconstituted “on the fly.” From July 22, 1944, through January 1945, the division suffered 15,000 casualties, with many of these occurring in December 1944, during the Germans’ Ardennes offensive. Brig. Gen. Don F. Pratt was the assistant division commander of the 101st Airborne Division and was in the first wave of glider landings in France, which began at 3 am on D-Day. His glider took a lot of enemy fire as it approached the field surrounded by hedgerows that was his designated landing area. When the glider landed, cargo broke loose from its moorings, broke through the bulkhead, and crushed Pratt, who was sitting in the cockpit. Pratt was the first general officer to die (but the second U.S. airborne general), on either side, on D-Day. During the course of the war, approximately 22,000 Americans were held as prisoners by the Japanese. Of these, about 7,000 died during captivity, some of them by execution. In contrast, over 100,000 Americans were held as POWs by the Germans, but 98 percent of them survived. Part of the difference was a deeply held cultural belief of the Japanese. To them, surrender was unacceptable, and if the enemy surrendered they were unworthy of any consideration for humane treatment. This same attitude no doubt accounts for the relatively few Japanese taken prisoner by American or British forces. They would fight to the end or commit suicide rather than be taken prisoner. The Japanese also did not observe the Geneva Convention, and wounded men would not yell for a medic, as it would draw enemy fire. Medics would not wear the traditional red cross on their uniforms because it would be a target for the enemy. Brig. Gen. Guy O. Fort commanded the 81st Division in the Philippines at the time of the massive Japanese invasion of Luzon. Nothing more is known of Fort’s death, only that he was captured, tortured, and executed by the Japanese in 1942. Brig. Gen. Vicente Lim was a native Filipino, with a military education that included officer training at Fort Benning Infantry School. One of his classmates at Fort Benning was Akira Nara, who as a Japanese general was in combat with Lim’s 41st Division on Bataan. Lim was taken captive at Bataan and survived the infamous death march. He was freed by the Japanese, as they were attempting to separate or alienate Filipinos from the United States. Once freed, Lim became a member of the resistance. He was captured again in the vicinity of Manila and taken to Fort Santiago. After being tortured, he was executed by the Japanese. Lt. Gen. Frank M. Andrews was a pioneer in the field of military aviation. He graduated from flight training in 1918, too late to be involved in combat in World War I, but was appointed air services officer for the American Army of Occupation in Germany in mid-1920. He was promoted to brigadier general in 1935, and all of the U.S. Army’s air strike elements were placed under a single commander. Promoted to major general, Andrews became an advocate of an independent air force to the extent that he ran afoul of the general staff. For his advocacy, he was exiled to Fort Sam Houston, Texas, and reverted to his permanent rank of colonel in 1939. Andrews’ banishment did not last long, however, as the new chief of staff, General George Marshall, brought him back to Washington, D.C., as the assistant chief of staff of the Army for operations and training. Promoted to lieutenant general, Andrews assumed command of the Caribbean Defense Command in 1941. In 1942, he became the commander of all U.S. forces in the Middle East, and in February 1943, he was given supreme command of all U.S. forces in the European Theater of Operations (ETO). Unfortunately, three months after this assignment he was killed in the crash of a B-24 Liberator bomber while attempting a landing in Iceland. Andrews Air Force Base in Maryland, on the southeast outskirts of Washington, D.C., is named in his honor. Brig. Gen. Charles Henry Barth, Jr., was the chief of staff for General Andrews’ European theater command and was on the same flight that crashed in Iceland, killing General Andrews and 13 others. Maj. Gen. Hugh J. Gaffey entered the military in 1917 as an artillery officer. He commanded the 2nd Armored Division in North Africa in 1941, and was promoted to major general in 1943. In 1944, he became chief of staff of General George S. Patton’s Third Army. Gaffey commanded the 4th Armored Division during the relief operation at Bastogne. Following this successful operation, he was given command of VII Corps. He was killed in a plane crash shortly after the capitulation of Germany in 1945. Brig. 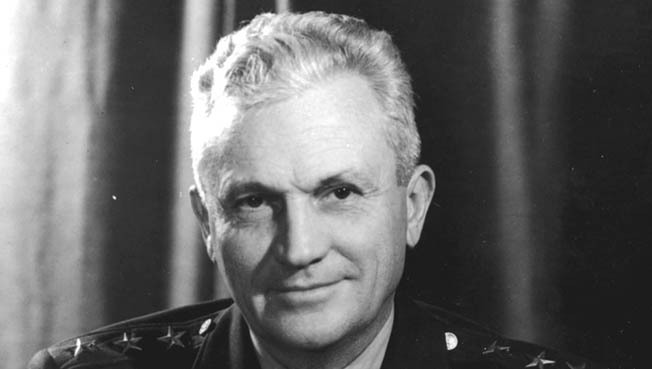 Gen. Stuart Chapin Godfrey was commander of Geiger [Air] Field near Spokane, Wash. Godfrey had directed construction of airfields in the China-Burma-India theatre for use by B-29 Superfortress bombers on raids against Japan prior to assuming command at Geiger Field. He was returning from a conference at Fort Hamilton in San Francisco in 1945 when his plane crashed into a small hill six miles from Geiger Field. Major Gen. Stonewall Jackson was commander of the 84th Infantry Division at the time of his death in 1943. Jackson had only been in command a few months, assuming command of the division in February 1943, and he was promoted to major general in March. The division was on maneuvers at Fort (then Camp) Polk, La. The 84th Division arrived in France in November 1944, and participated in crashing through the Siegfried Line at Wurm and Mullendorf. Jackson was not related to the famous Confederate general, but his father, as a cavalry officer, had served under that General “Stonewall” Jackson. Lt. Gen. Lesley McNair was one of the highest ranking American officers killed in World War II. McNair had been commander of Army ground forces and was responsible for training of all components of the active Army, Army Reserve, and National Guard. He wanted a field command but never received one. As frequently as he could, he visited the fronts and was wounded in Tunisia. He was made commander of the mythical 1st Army Group, replacing General Patton McNair was observing the 30th Infantry Division’s preparations for deployment to St. Lo in 1944 when the Army Air Corps accidentally dropped bombs on his position and he was killed. He was posthumously promoted to full general in 1945. Ironically, his son, Colonel Douglas McNair, chief of staff of the 77th Division, was killed two weeks later by a sniper on Guam. Roosevelt, son of President Theodore Roosevelt, had fought in World War I and was wounded in action. He was recalled to active duty at the outset of World War II as a colonel. He fought in North Africa, unfortunately leaving a negative impression on General Omar Bradley, commander of II Corps, who subsequently relieved him of his position as assistant division commander of the 1st Infantry Division. Following an assignment as liaison officer with Fifth Army, he became the assistant division commander of the 4th Infantry, the unit he led ashore at Utah Beach on D-Day. Credited with leading several units across the beach and maintaining the momentum of the landing, Roosevelt was posthumously awarded the Medal of Honor. General Patton attended Teddy Roosevelt Jr.’s funeral on July 13, 1944, shortly after D-Day. On July 12, 1944, Roosevelt was given command of the 90th Division. He died later that night of a heart attack, at the age of 57. The 90th Division had already witnessed three commanders being relieved, and this incident reinforced the unit’s image as a hard luck division. Roosevelt was buried at Colleville-sur-Mer, Normandy. The body of his brother Quinten, who had been killed in World War I, was exhumed from the cemetery at Chateau-Thierry and reinterred next to Roosevelt. General George S. Patton Jr., died quietly in his sleep on December 21, 1945, from complications from an automobile accident near Mannheim, Germany, on December 9. It is ironic that a man who led such a stormy, albeit glorious, career, constantly in combat when given the opportunity, should so quietly leave the stage. It seems as if Patton spent nearly as much time in hot water as he did in battle. Few have ever argued with his military genius, but his brashness and outspoken attitudes and opinions were constant thorns in the side of Generals Eisenhower and Bradley. Patton had been commissioned into the horse cavalry and served under General John J. Pershing in World War I. He remained committed to armor throughout his career. His last command was Third Army, which he led into Germany and also into Czechoslovakia. Tags Adolf Hitler, Africa, African-American, after d-day, airborne, Allies, American, Americans, Ardennes, Ardennes Offensive, armed forces, army, Army Ground Forces, Army Rangers, artillery, Axis, Bastogne, British, Burma, cavalry, China, CIA, civil war, Confederate, confederate general, Czechoslovakia, D-Day, Dice, during the civil war, Dwight D. Eisenhower, Europe, European Theater, Fifth Army, Florence, Fort Benning, Fort Donelson, France, Gela, general, General George C. Marshall, General George S. Patton, General Omar Bradley, Geneva, Geneva Convention, German, Germans, Germany, Guam, Hawaii, hitler, iceland, india, Italy, james, Japan, Japanese, Jeep, John J Pershing, Leyte, Luzon, Manila, Mary, medal of honor, military, military aviation, national guard, Normandy, north africa, Odo, Okinawa, Old Ironsides, OSS, Pacific, Pacific Theater, Pearl Harbor, pearl harbor attack, Philippines, POW, POWs, Rangers, riga, Riva Ridge, Royal Air Force, Russia, sam, Santiago, SAS, Sicily, siegfried Line, Simon Bolivar Buckner, Sniper, South Pacific, Soviet Union, spear, Stalin, Stonewall Jackson, Teddy Roosevelt, Tern, Texas, the civil war, The Division, The Pacific, the pearl harbor, the pearl harbor attack, Theodore Roosevelt, Theodore Roosevelt Jr, Thor, Tory, Tula, Tunis, Tunisia, Union, United States, us armed forces, US Army, us military, Utah Beach, V-E Day, Wii, WIN, World War I, wounded, WWI, WWII, wwii history, XIV Corps. The last sentence in the piece on General George S. Patton Jr. is incorrect. After commanding the Third army, he was appointed as commander of the Fifteenth army. Brig. Gen. Keerans, who went MIA in Sicily, was the ADC of the 82nd Airborne Division, not the 101st as reported in the article. The 101st didn’t participate in the invasion of Sicily. General Patton was assassinated. He was involved in the Red War Plan. Brig. Gen. Smedley Darlington Butler gave testimony to Congress in a plot to over throw FDR. Recently Bill O’Reilly’s book indicates Patton was shot with a rubber bullet which did not kill him but resulted in paralysis during the staged auto accident. He was recovering with feelings of sensation in his limbs. O’Reilly erroneously reports a Russian spy was able to enter his hospital room to end Patton’s life. Patton disobeyed Eisenhower numerous times during battle. Patton’s plan with the 3rd army and over 5,000 German soldiers who were to be rearmed once in Berlin, were to fight any Russian troops and carry the attack into Russia to defeat communism. It is believed that Eisenhower ordered the attack and was rewarded with the Presidency for his silence. Ike was never involved with politics prior to his candidacy. He was not a registered member to any political parity a rarely voted. This could explain why Truman agreed to Russia’s demands for compensation after Germany was defeated. Stalin learned it was the American Industrialist and their investment in Germany’s war machine with the understanding the Nazi’s were to rid the world of Communism. FDR asked the FBI to look into Butlers testimony which resulted into an investigation of Prescott Bush,(father of George Bush) and Union Bank whose assets were frozen because it was funneling money to the Nazi Party. If it wasn’t for foreign investment and the compensation plans placed on Germany after WW1 over the Treaty of Versailles, such as the Dawes plan which offered capital to Germany to build their war machines with little oversight, then WW2 may never have occurred. Well it looks like leaving was a good plan then. Major General Clarence Tinker was the first American general killed in WWII. He went down 6-7-42 at Midway.